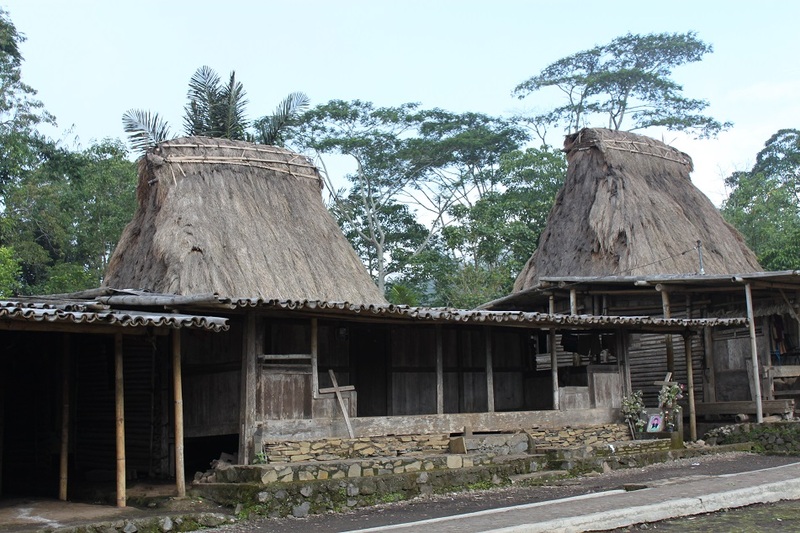 Wogo and Bena: A Tradition Preserved | What an Amazing World! Leaving Ende with its mountains and blue pebble beaches we continued our journey westward to Bajawa, the capital of Ngada Regency on the island of Flores. Situated on the slopes of Mount Inerie with its near-perfect cone, the temperate climate of the town made it a nice and comfortable place to escape the humidity of the lowlands. 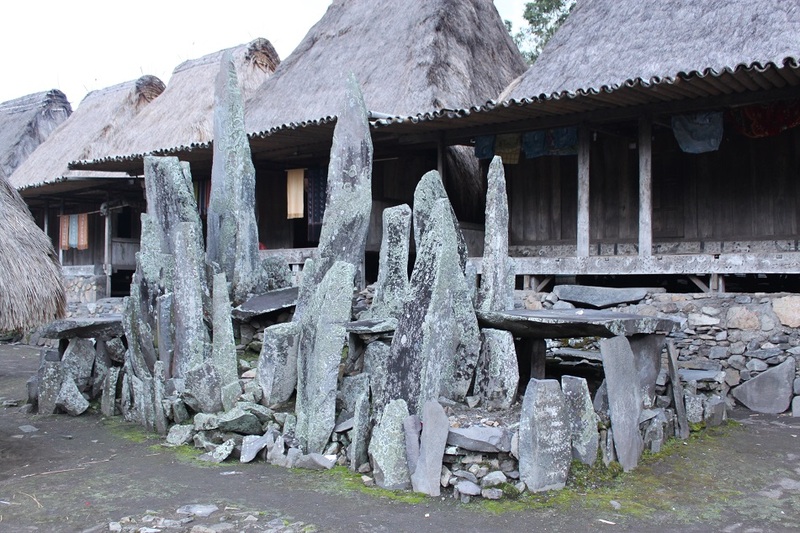 But James and I didn’t go to Bajawa for that, rather we were intrigued by the Ngadanese traditional villages where people still practiced animist belief with touches of Catholicism. 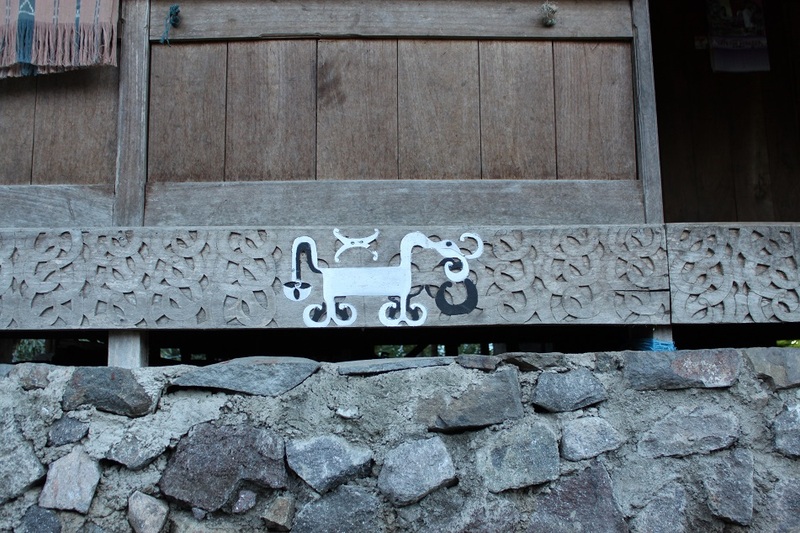 “In Bena you will see houses with male and female symbols, but in Wogo the symbols are inside the house,” Dino further illustrated, trying to give us an idea of what we would see later that day. 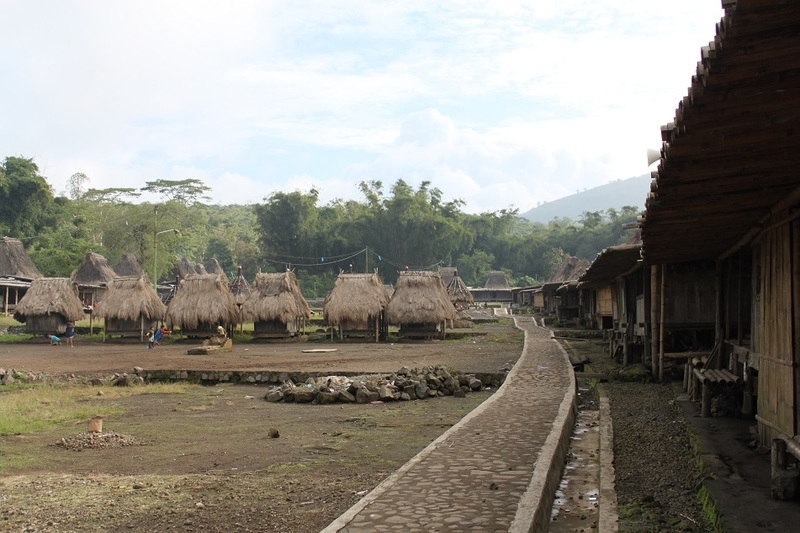 After hours of navigating Trans-Flores highway’s long and sharp turns, we were minutes away from Wogo, our first village. 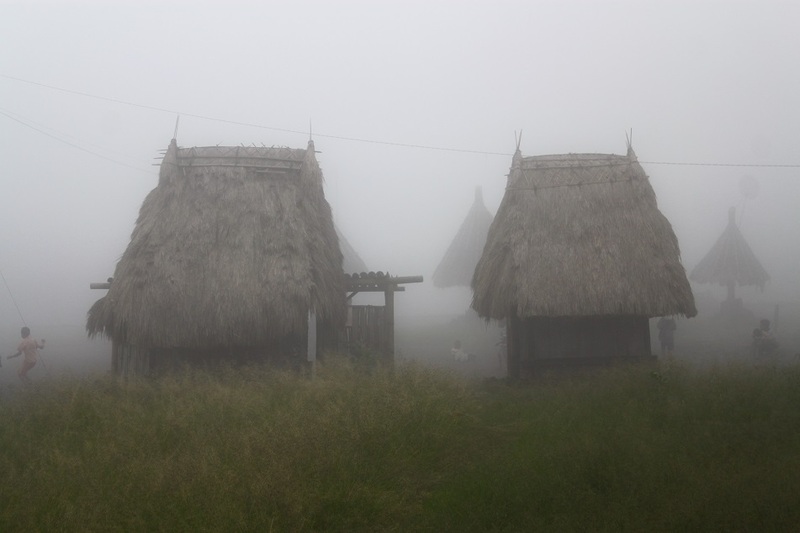 As we approached the village fog started to fall, thin and vague at first but soon it became very thick, significantly reducing our visibility to only a few meters. Dino started to have doubts. “We should. It’s okay, the fog won’t linger,” I told him. My words were 5% confidence and 95% hope. 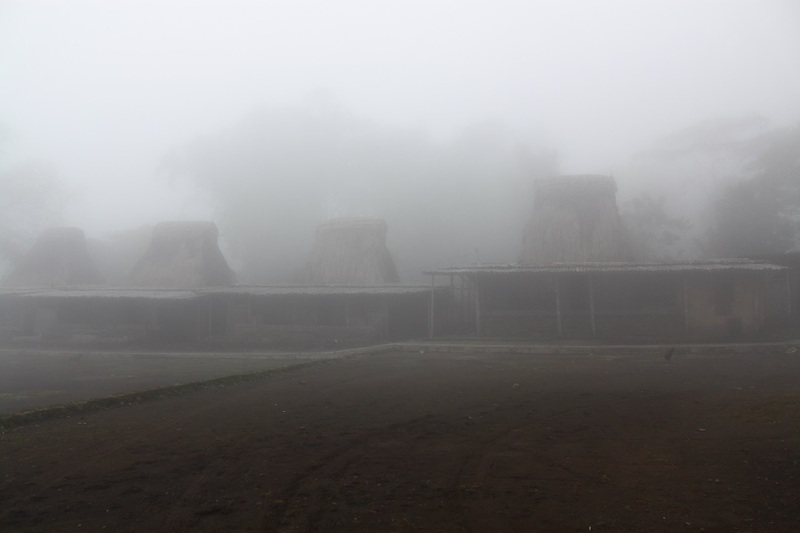 Moments later we arrived at Wogo, eerily quiet while the fog was still blanketing the village. Only a few houses were visible from where we stood, no sound at all, only an old woman living in one of the outer houses greeted us. As soon as James and I started to break the silence with the sound of our cameras’ shutters, the fog slowly lifted up. First rows of houses started to be clearly seen, then… two, three, four kids suddenly appeared, playing in a dirt field nonchalant of our presence. 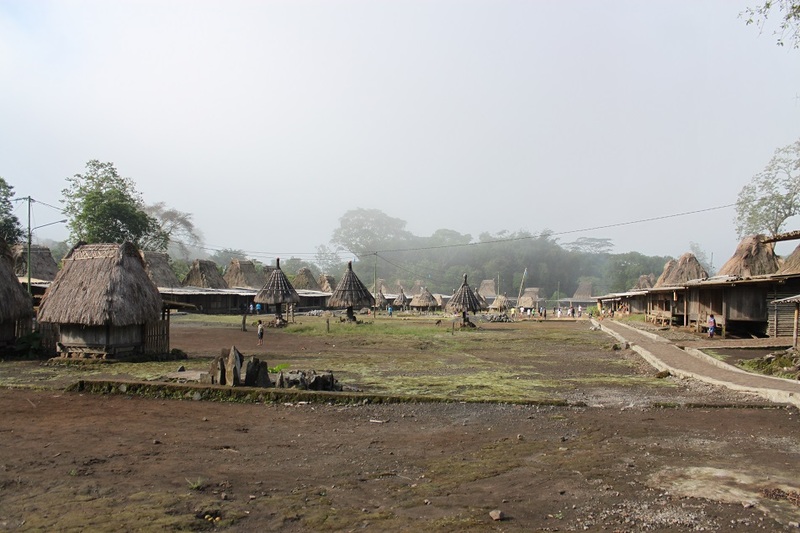 As the minutes progressed the disappearing fog revealed not only the still structures of the village, but the entire populace of Wogo. They were there out of their houses since before our arrival, but curiously the fog not only concealed sight, but also sound. 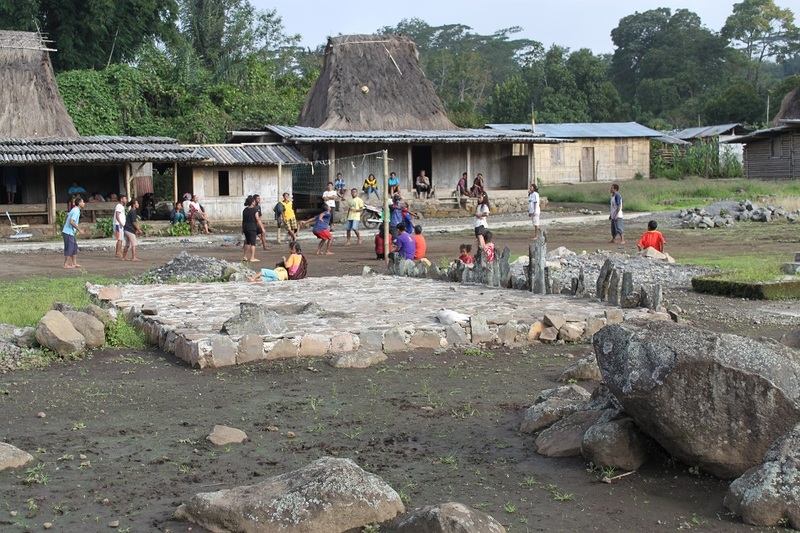 The village was actually new Wogo as the old village was burned down some time ago. 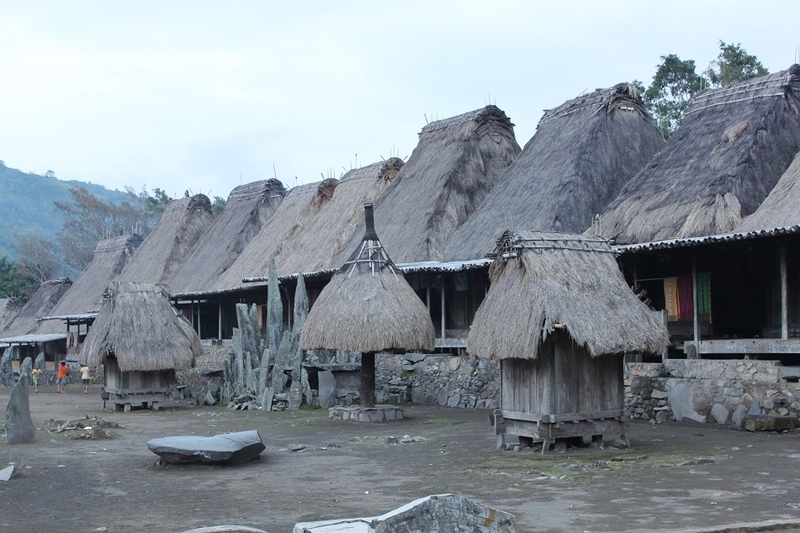 But Dino assured us that the new village was built exactly in the same manner like the old one, preserving the traditional U-shape layout where thatched wooden houses surround an open space dotted with small umbrella and house-shaped structures. After walking on the cobblestone pathway around the village and exchanging smiles with some friendly and curious locals, we went back to our car to continue our journey to Bena before the day got dark. Bena is arguably the most famous of all traditional villages in Ngada and upon our arrival at the village we figured out the reason. Sitting on an uphill terrain right beneath the behemoth that is Mount Inerie, Bena was both picturesque and atmospheric. 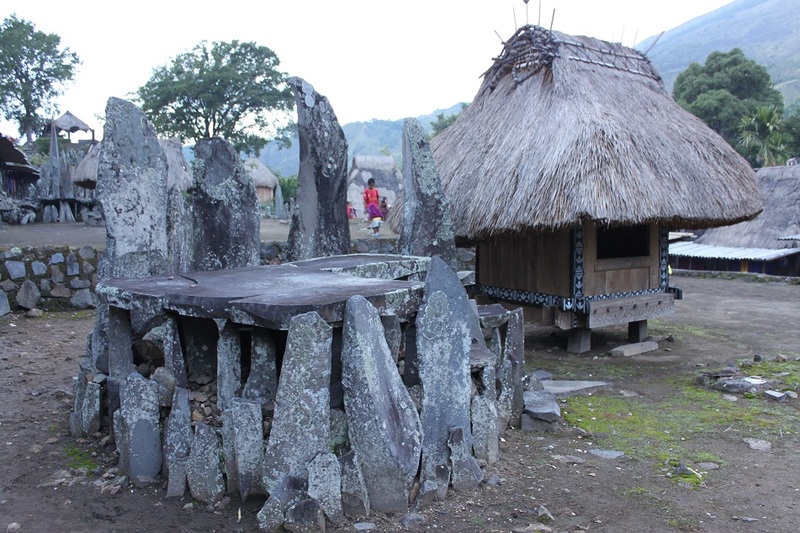 Encircled by traditional houses and divided into several levels, the open space of Bena was filled with a cornucopia of ngadhu – umbrella-shaped thatched structures, bhaga – small house-shaped structures, and a number of megaliths with big pointy stones piercing the ground. A long time ago Bena was founded by ten men and eight women, the first settlers of the village and ancestors of almost everyone living in Bena today. 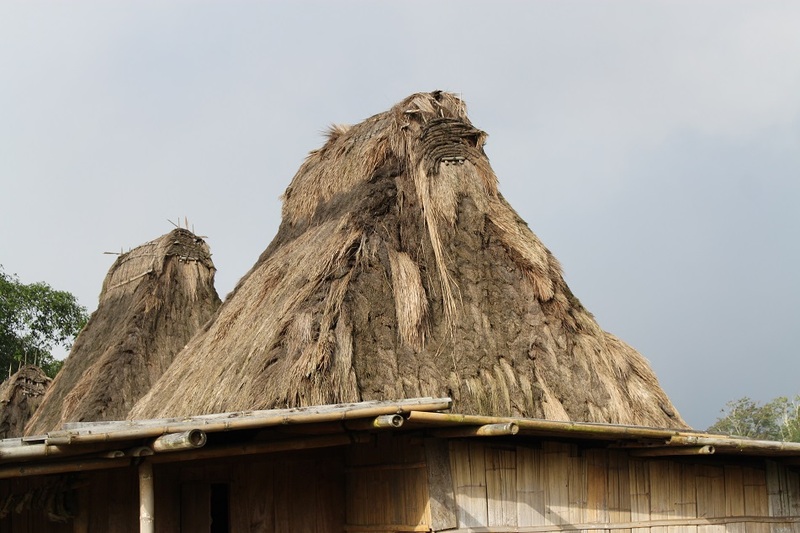 As with other animist beliefs, veneration of ancestral spirits forms the foundation of the local people’s beliefs, therefore they erected scores of ngadhu and bhaga, representing their male and female ancestors respectively. Each ngadhu was crowned by a man-like effigy with both hands holding weapons: a knife and a spear. 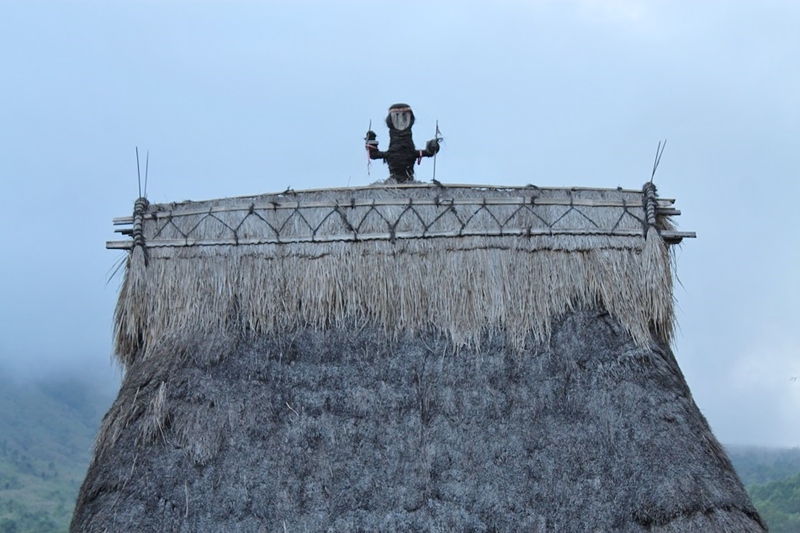 Meanwhile, with a hollow space underneath the thatched roof a bhaga was less decorated compared to a ngadhu. 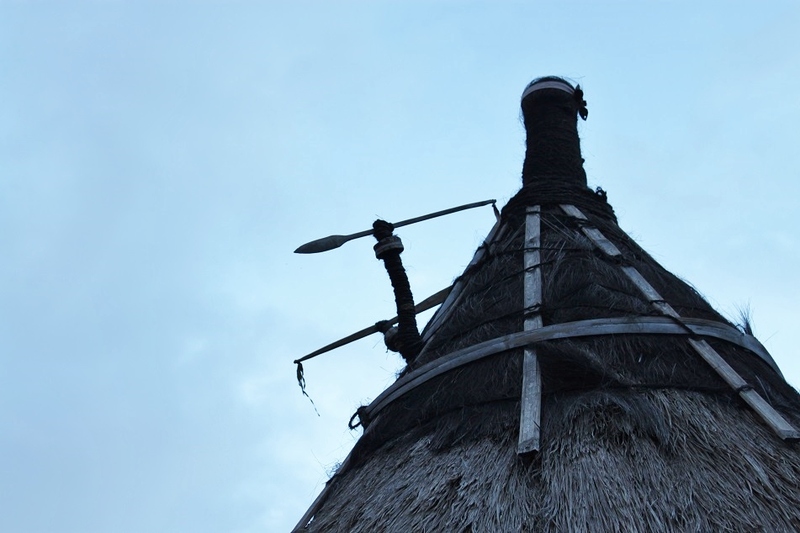 The male and female symbols were found on top of the 18 original houses in Bena – representing the number of the village’s ancestors, ten men and eight women – as well as on newer houses, signifying which side of the ancestor a clan came from. 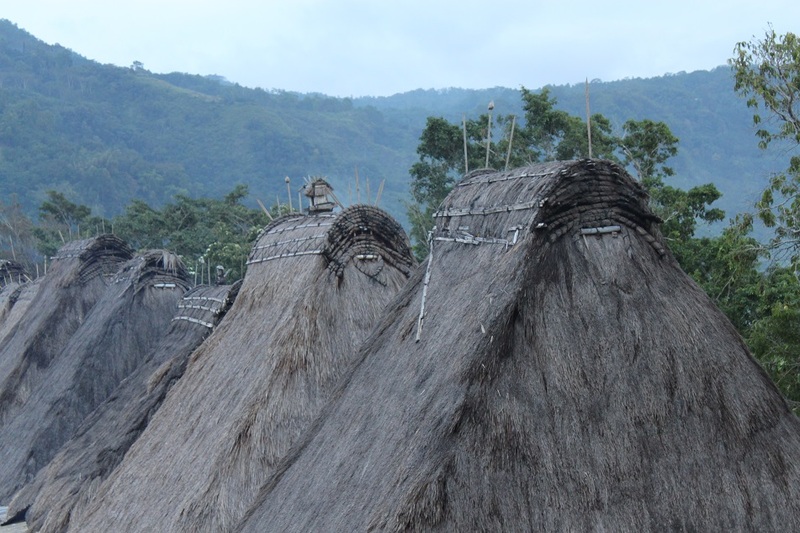 Contrary to the houses in Wogo where male and female symbols were hidden inside the houses, in Bena they were proudly displayed on the roofs. The sun started to hide behind the clouds in the western horizon, leaving just enough light for us to roam the village for a few more minutes. We walked uphill, past the megaliths which were once used for placing offerings to the ancestors. 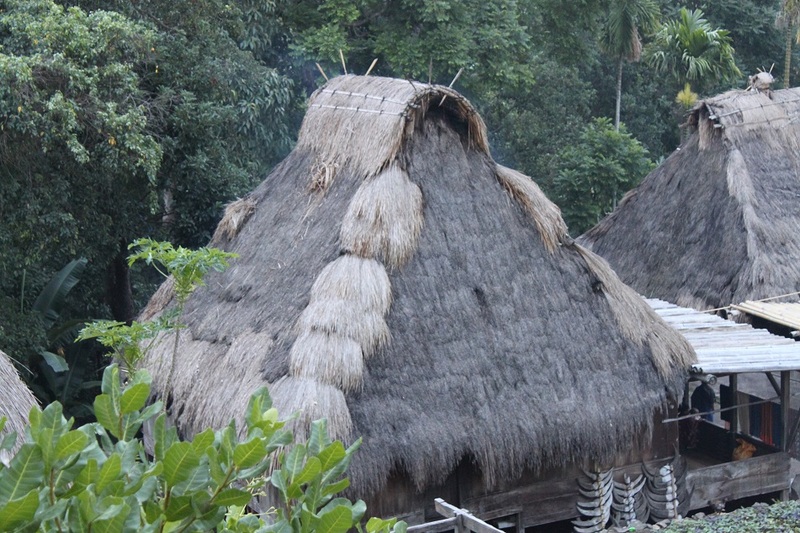 Today, however, the locals use them as the court of arbitration to solve disputes in the village. Perched at the end of the hill, a grotto with a statue of the Virgin Mary overlooked the entire village, a reminder of the village’s embrace for Catholicism despite people’s adherence to animist rituals. From this vantage point it was clear how Bena was precariously sandwiched between Mount Inerie and verdant hills, making this tranquil village naturally protected from the outside world. Hence the late arrival of Catholicism to the village. I turned my back and looked at the village. To my left two teams of young men were playing volleyball, watched by other villagers from their houses, while children were running around the megaliths. Whenever the options of entertainment are limited, sport seems to always be the preferred choice for most people to kill time. 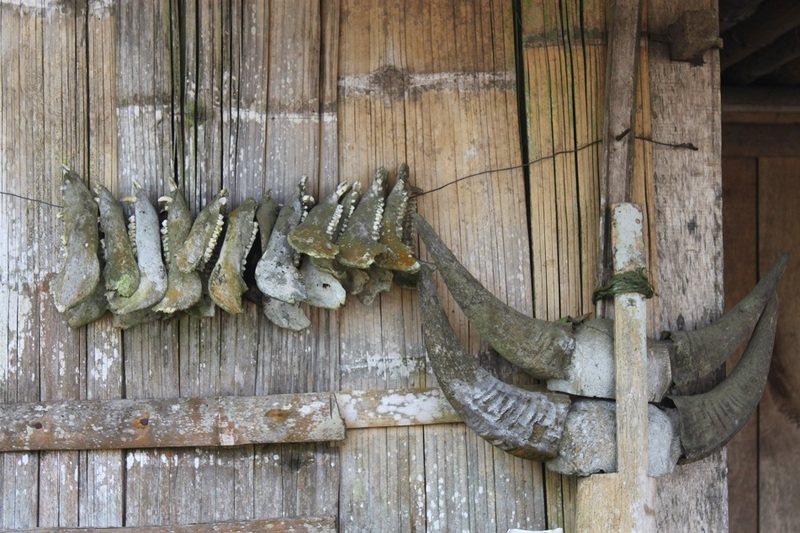 It was a few minutes before sunset, and we walked down to where our car was parked, past the unique traditional houses with wood carvings, buffalo horns, and colorful cloths strewn all over their verandas. 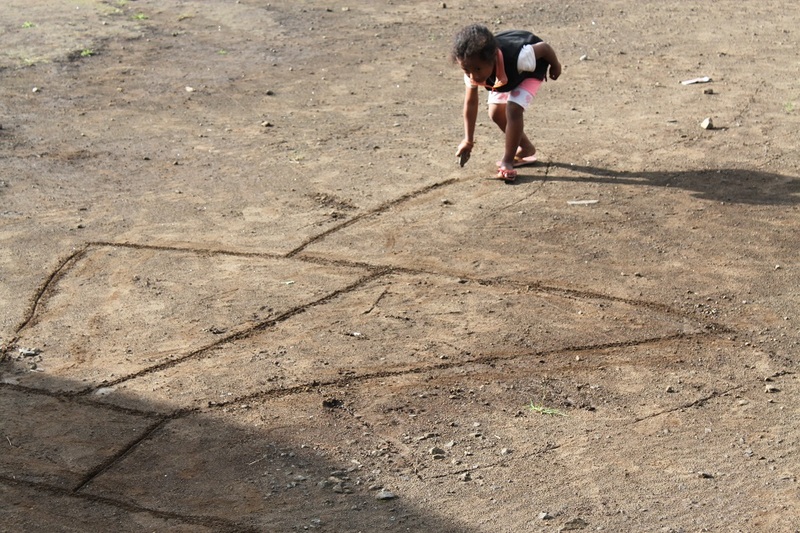 When we walked closer to the last house, an old man signaled us to come into his house. “It’s the house of the chief,” Dino told us. The old man smiled at us, showing his red-tinted teeth and lips from chewing betel nut and leaves – a habit shared by many Florenese – and ushered us in. 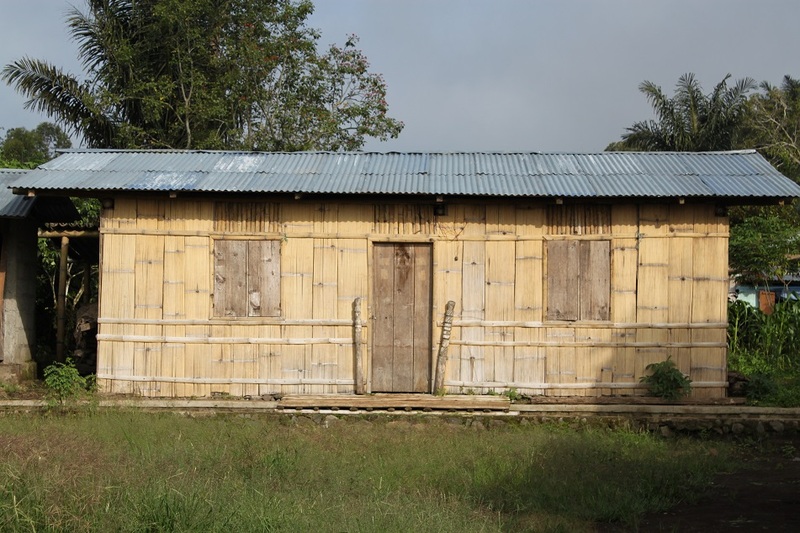 Inside the wooden house, the strong smell of dried cocoa beans filled the air as they were spread out on the floor. Small light bulbs were the only source of light, bright enough to allow us to identify everything under the roof. 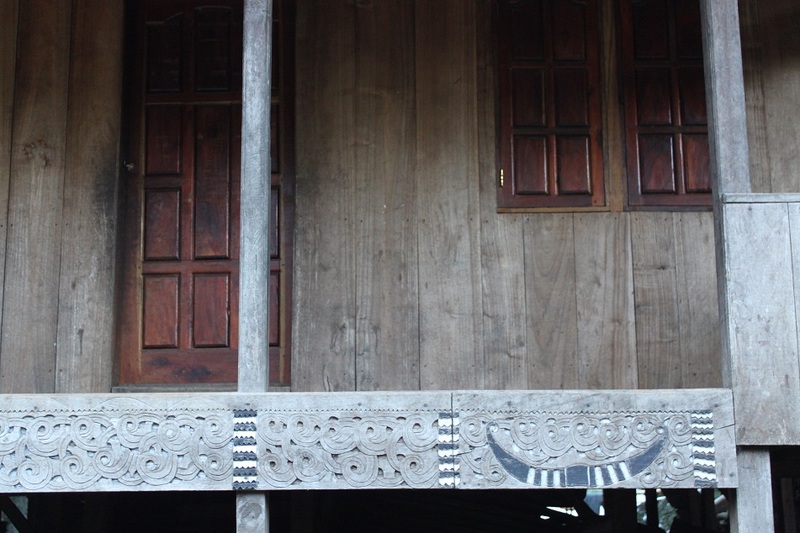 With hand gestures and broken Bahasa Indonesia, he told us to go through a narrow door to enter a chamber at the center of the house, the most important part of a Ngadanese house. To our right, a small traditional kitchen was smothered in soot, while in front of us three important artifacts were hung on the wooden wall. 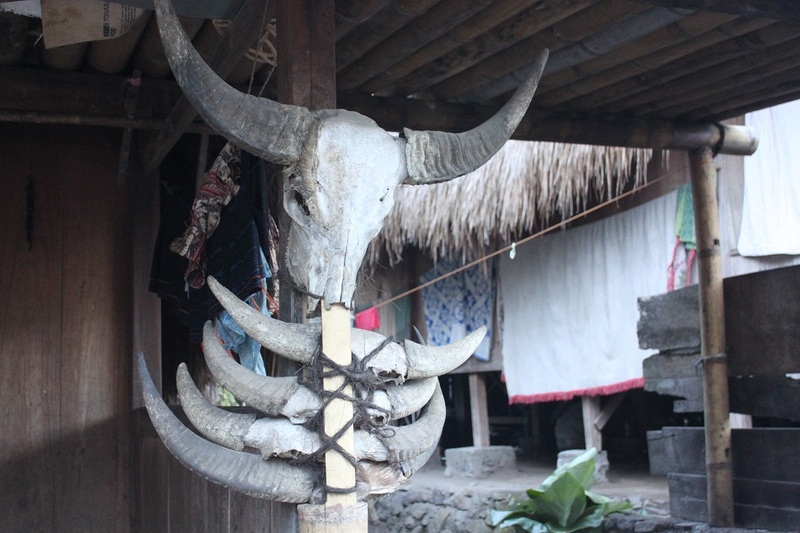 In the best Bahasa Indonesia he could possibly speak the old man explained about each item: a spear for traditional ceremonies, a dagger for sacrificing animals, and a small pouch for arak, a traditional liquor essential for Ngadanese during ceremonies. Despite only understanding a portion of what he explained to us, it was obvious that the old chief was more than eager to share the local values for the entire village depended on people like him to preserve their unique culture. “You can’t just walk around the village and understand it,” he said. 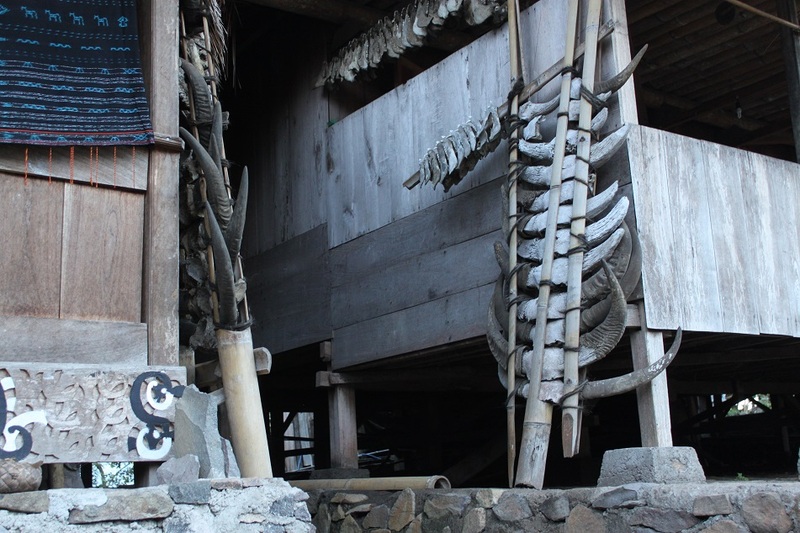 He might have a big responsibility to preserve the village’s culture. But that night he was more interested in spending quality time with his friends in another village, probably with endless supply of arak. Dino was very close to turning back the car toward Bena. What I had in mind was if the village turned out to be thickly blanketed by the fog, at least we tried. 🙂 You’re right about Bena, James. Not only were the people so friendly, but the location of the village itself was truly breathtaking. Not everyone wakes up everyday with a view of a volcano with a near-perfect cone. Thank you, James. Beautiful pictures! Thank you for the visit! And thank you for reading and leaving such a lovely comment. 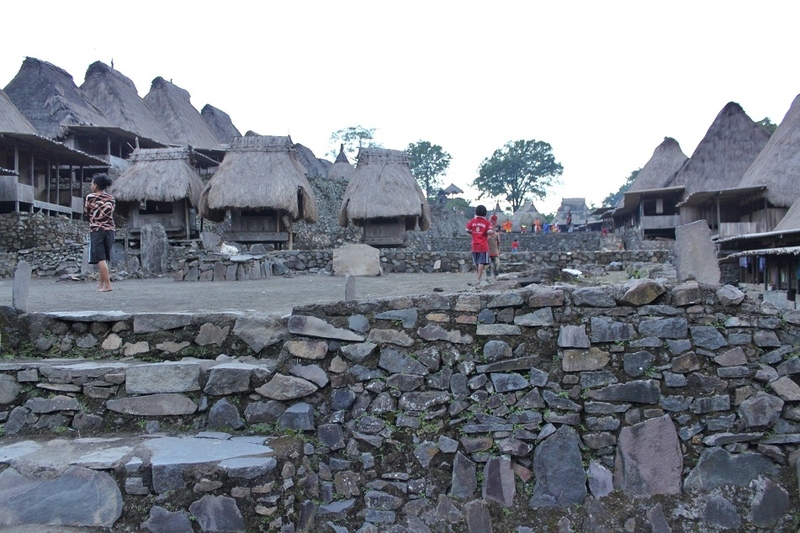 Ngadanese villages were very unique and picturesque, indeed. It really looks like it is worth a journey. Thanks for sharing your insights! Hi Moritz. 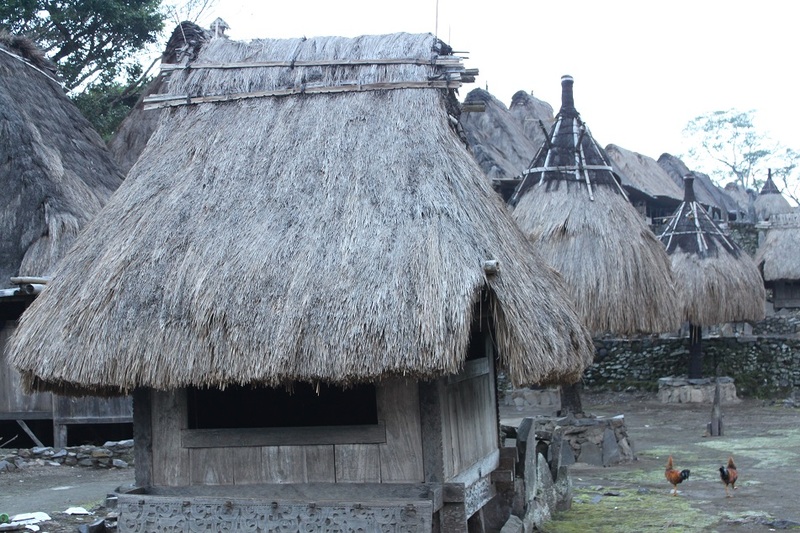 Those Ngadanese villages, and the island of Flores in general, are really worth visiting. You might need to take many flights to get there, but you won’t regret it. Thank you! Bama, over the years, you have metamorphosed into such an extraordinary traveler! Your stories are now not just a mere observation, but also a lively interaction with locals. And oh, the first two pictures are mesmerising. Mysterious and creepy at the same time! The mist makes Wogo even more beautiful. Mysterious and eerie…..I love it! The scenery over Bena is also very picturesque ya. Gahhhh, I need to book my ticket to Flores soon! Eh, but which month is the best time to visit this island, sih? Thanks Debbie! It was already quite dark when we arrived in Bena. I could only imagine how magical the village would look in the morning. Yesss, book your tickets soon! I guess dry season would be perfect. We went in late June and it rained occasionally on the island. Maybe September would be perfect. Thank you, Rajiv. I guess the fog made the village atmospheric, in a way. This was a fascinating read – it has really cheered up my ‘office’ Monday and given me a good injection of wanderlust. Thank you! Well, the pleasure is mine! 🙂 I’m glad this post did that to you, and hopefully someday you’ll make it to Flores. Thank you for sharing, your pictures and story are very interesting and informative. My pleasure! And thank you for reading and sharing your thoughts. The blogosphere is truly where people inspire each other. Btw nice post! As usual! Impressive, great story too! Thank you so much for sharing this, truly intriguing! Sama-sama, Indah. Those two traditional villages clearly exceeded my expectations. 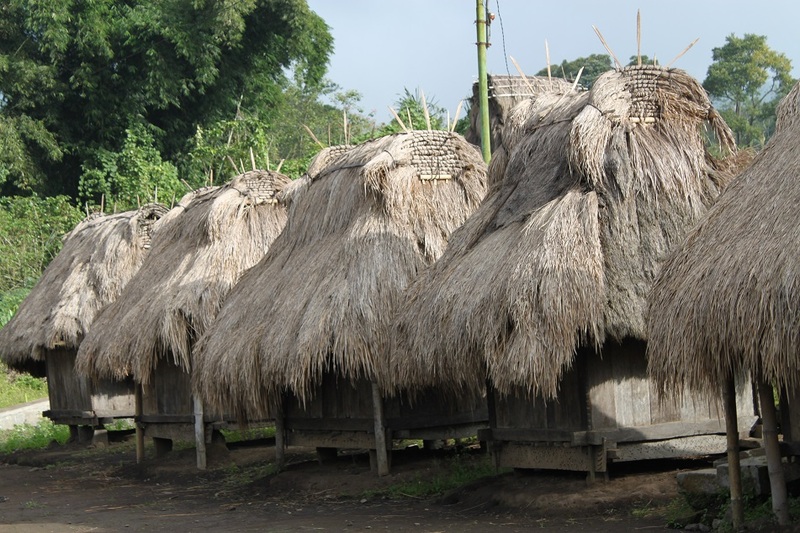 Too often we heard news about commercialism taking over people’s way of living in traditional villages elsewhere. I’m glad that was not the case with Wogo and Bena. How fantastic the fog lifted so we could see these amazing captures. As Indah says very intriguing. It didn’t take long for us to wait for the fog to clear up, fortunately. What really intrigued me was the fact that somehow the fog concealed the sound and made an impression that the village was abandoned at first. Thank you, Sue. How eerie Bama. What a wonderful surprise to have it not be abandoned! Wow, that is one of your most fascinating visits and posts yet! The history, culture, and architecture are truly extraordinary. Yesterday I was talking to my son, who lives in Australia, and he told me he and his wife just made a list of places they want to go during the years they are living there. I sent him your blog site, and told him your words and photos would inspire them to visit Indonesia. Thanks so much for sharing your world with all of us! Yes Marilyn. 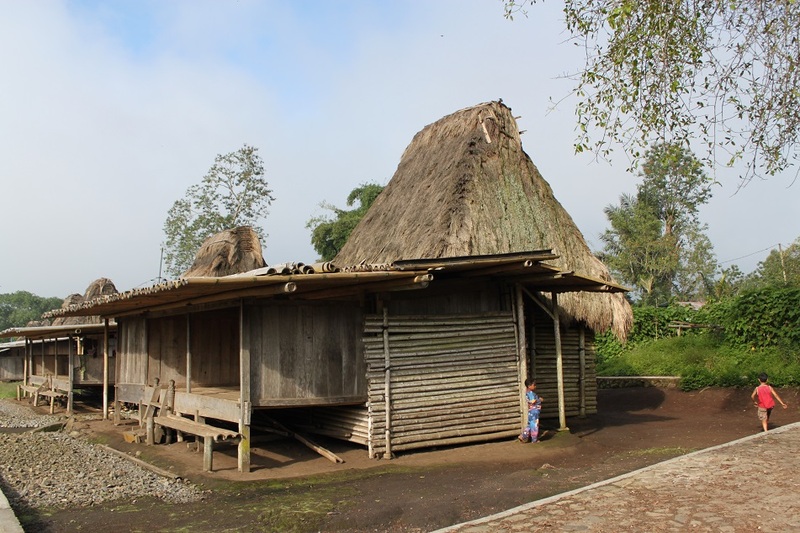 Those traditional villages were very special and we’re glad to get the chance to go inside one of the houses to see how life was like for the locals. Wow, that is truly kind, Marilyn. Thank you for recommending my blog to him. Indonesia is just north of Australia and there are many flights connecting cities in both countries. If he needs some recommendation I would be more than happy to help! Thank you again! Thanks so much, I’ll pass along the info! 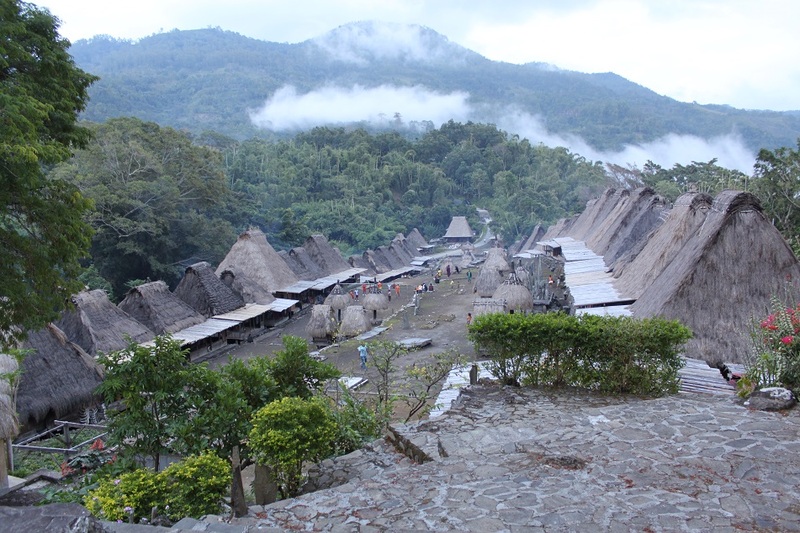 Great insight into this part of Indonesia! great pics. thankxxx for sharing….I’ll read soon once more in a slow motion. greeting from cabo verde. I did! 🙂 I would go back to Flores in a heartbeat anytime I get a chance to do so. And yes, magical is the right word to describe how the village was like once the fog lifted. Thanks for reading. Wow, what a great adventure…and great photos as well. The fog descending on the village was very mystical, and then to find all that it had covered. Beautiful work Bama. It really was, Randall. 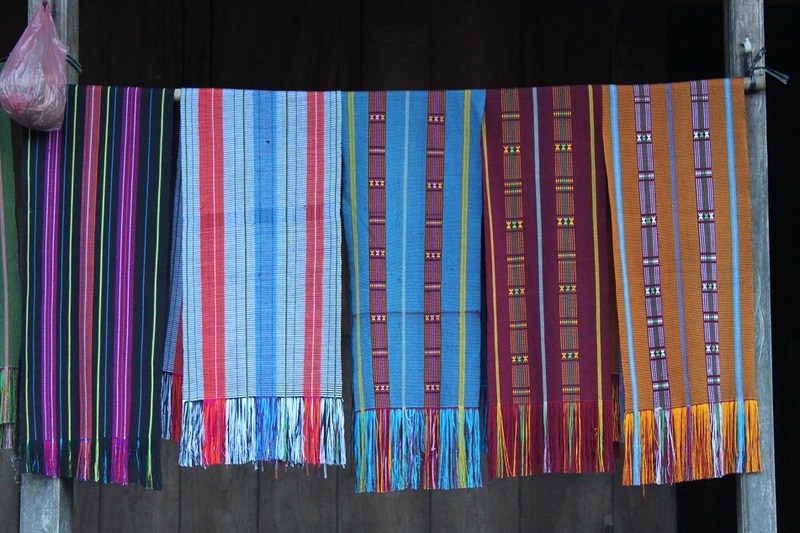 I know you would love Flores, and with your photography skill we can expect some magical images from you when you do go to the island one day. Thanks! Flores…you made it look like a dream 🙂 Just wonderful work as always from you! Cheers! At least it was a dream for me to visit the island. 🙂 Thank you for your kind words, Randall! Bama, cerita tentang Wogo & Bena ini bikin aku terdiam di kubikel. Scroll bawa, scroll atas, baca ceritanya, zoom in, zoom out, diem lagi…. 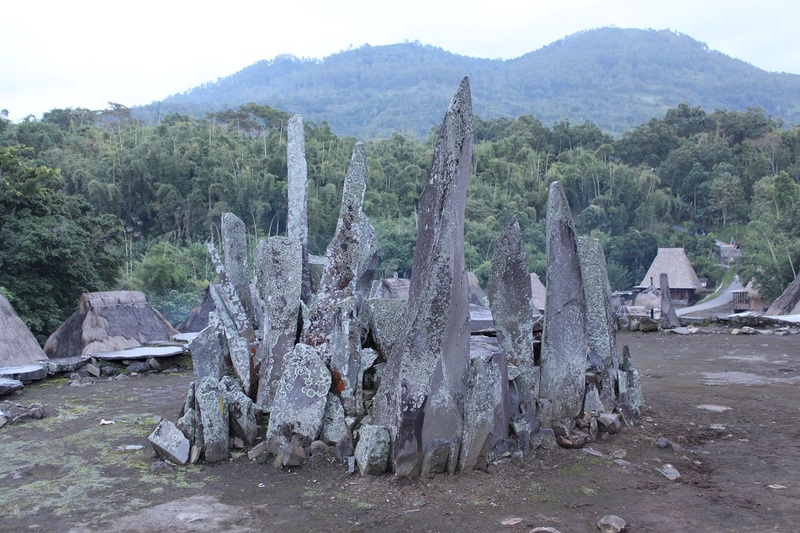 so amazed with their megalith culture, dan masih terjaga sampai sekarang. Hebat! Balik ke Flores lagi, jelajahi dari Larantuka sampe Labuan Bajo, borong scarf dari tiap daerah. Pasti pada mupeng.